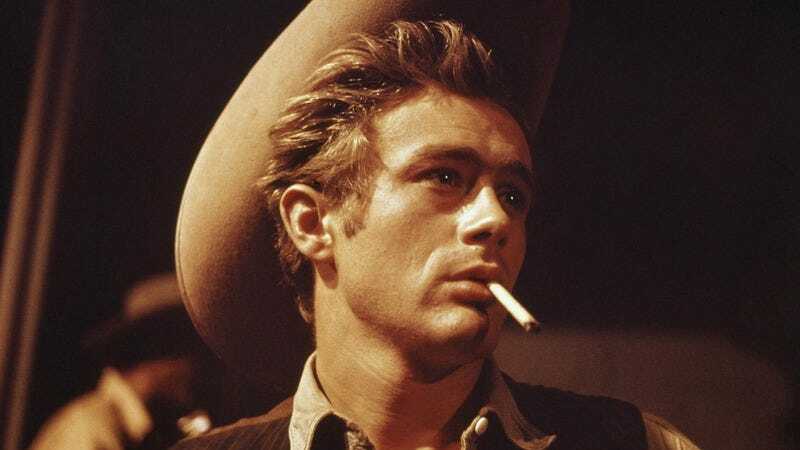 For decades now, James Dean has been a pop-culture icon on par with Marilyn Monroe or Humphrey Bogart, by way of an output that’s a mere fraction of theirs. He starred in only three movies within only two years and received posthumous Oscar nominations for two of them. We can point to Dean’s brevity as part of his legend, but we would also be wise to look at these three films to see exactly why he still resonates. Dean personified the Rebel Without A Cause, and he managed a sympathetic Cain figure in Steinbeck’s East Of Eden. But of the three, it’s Giant, which Dean finished only weeks before his death in a car crash, that best demonstrates what he was capable of as an actor. But the drama noticeably perks up whenever Dean is on the screen. His Jett Rink appears as soon as Benedict and Leslie come back from their honeymoon. Jett spends his time skulking around behind his 10-gallon hat and pining for the lovely Leslie. Dean was a Method actor trained by Strasberg himself, and incorporated all the techniques of his idol, Marlon Brando. He embodied the character of outsider Jett completely, barely speaking to anyone else on set. Jett’s plotlines develop mostly independent of the Benedict clan’s, and it’s more rewarding watching him in scenes with no dialogue—as when he joyfully explores a patch of land he’s inherited underneath the expansive Texas skies—than seeing Bick and Leslie argue. When Jett climbs a windmill to survey his new kingdom, Stevens unfortunately chooses to underline the moment with a marching-band-worthy score. Dean doesn’t need that kind of backup. Jett is always an outsider in the land-grabbing Benedicts’ world, but his love for Leslie fires up his ambition and turns him from a cowhand into a mogul. Dean was only 24 when he played the character, and ages 20 years in the film. Hudson (who was 31) and Taylor (23, even younger than Dean) grow older with some gray hairspray and drawn-on wrinkles. Dean merely combs his hair a different way, hunches his shoulders, and transforms into a destroyed man who’s gotten everything in the world except for what he really wants. It’s a bold leap, and at the end, despite Jett’s villainous money-grubbing traits, Dean makes him the most sympathetic character. It leaves one to wonder, sadly, what else the actor could have accomplished. Availability: Giant is available on Blu-ray and DVD from your local video store/library. It can also be rented or purchased digitally through the major digital services.